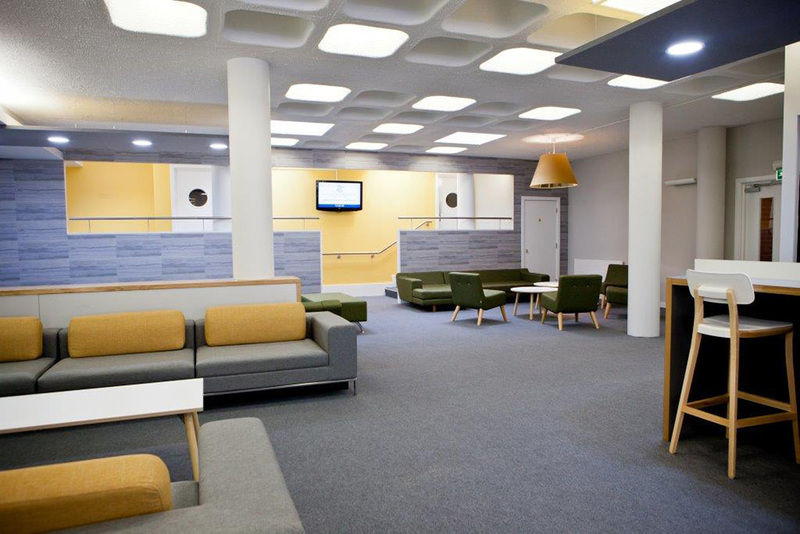 King’s College Sixth Form Centre is in the heart of the school and is fully co-educational. 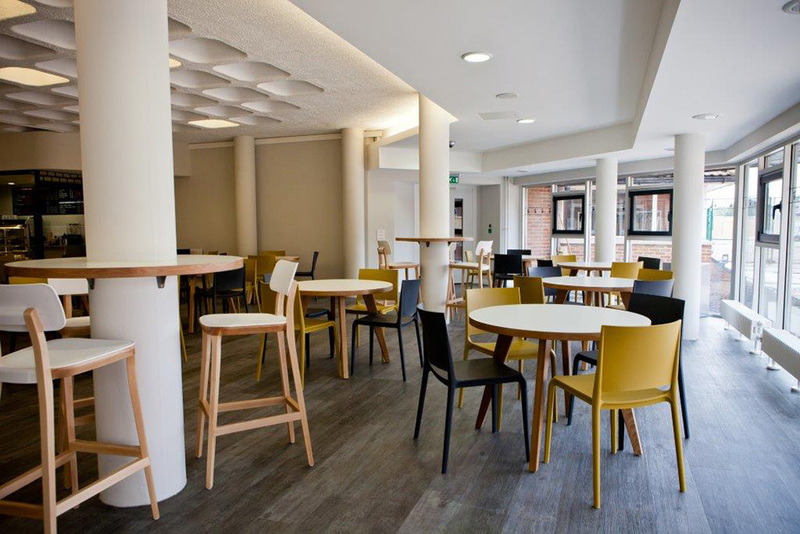 We were thrilled that King’s awarded the renovation project to Nikki Rees, a local Wimbledon based interior designer in collaboration with furniture contract dealer Action Workspace. 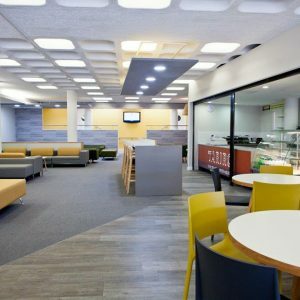 The client wanted the space to have a relaxed, collaborative and welcoming feel whilst allowing for eating, working and resting between classes. We spent time to understand the culture of the pupils and the school ethos. The role of sport, popular culture, friends and social media is key with this age group and was integrated within the design. It was important to keep the charm of the original building. The beautiful concrete coffered ceiling with its pure geometric form and clean lines creates a strong statement. The design has a subtle connection to the scale and soul of the architecture. 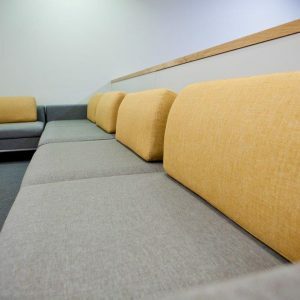 The layout took on this geometric pattern and used the full perimeter of the space to accommodate as many students as possible paired with flexible seating, which allows for organic movement. 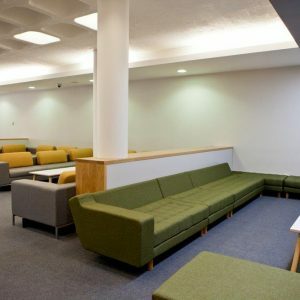 The furniture was sourced to be hardwearing and practical, the space is multifunctional, catering for students and school functions. 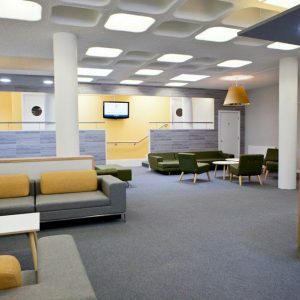 The space also plays a key role in attracting young people to study at King’s College School. There is an abundance of natural lighting filtering in from the floor to ceiling windows at the front of the building. 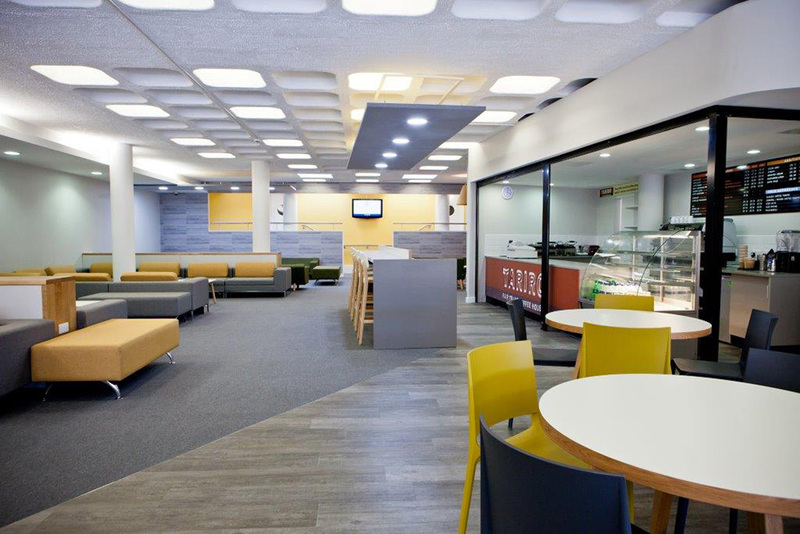 This was the perfect location for a Café area to the right and an informal learning zone to the left. 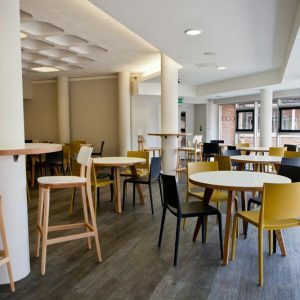 We love the simple and timeless designs from London furniture designer James Burleigh, and specified both the Jura tables for the Café area and the waldo/45 long Bench system to create a relaxed workspace and area for students to play chess. 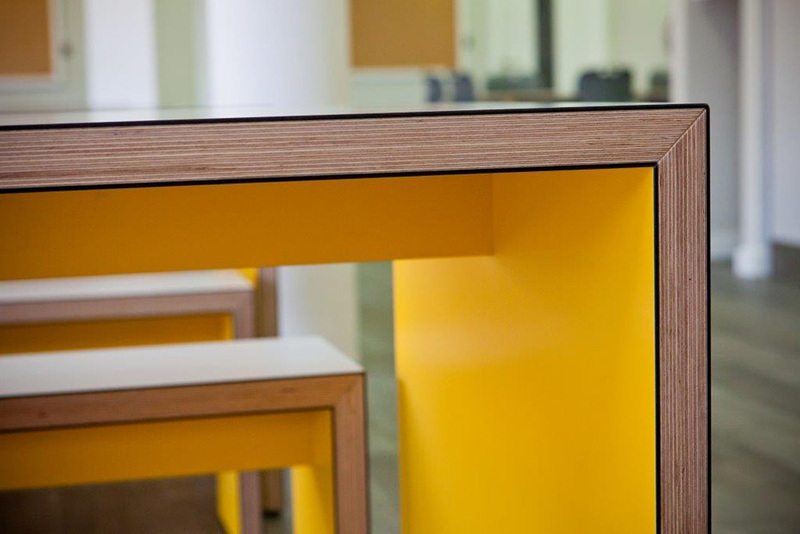 The distinctive hardwood edges and coloured laminate is timeless but with a twist. 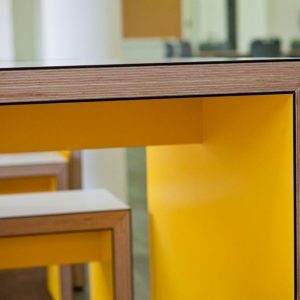 We selected an off white for the tops of the tables and a stunning yellow accent for below, giving a flash of colour visible from outside the building. 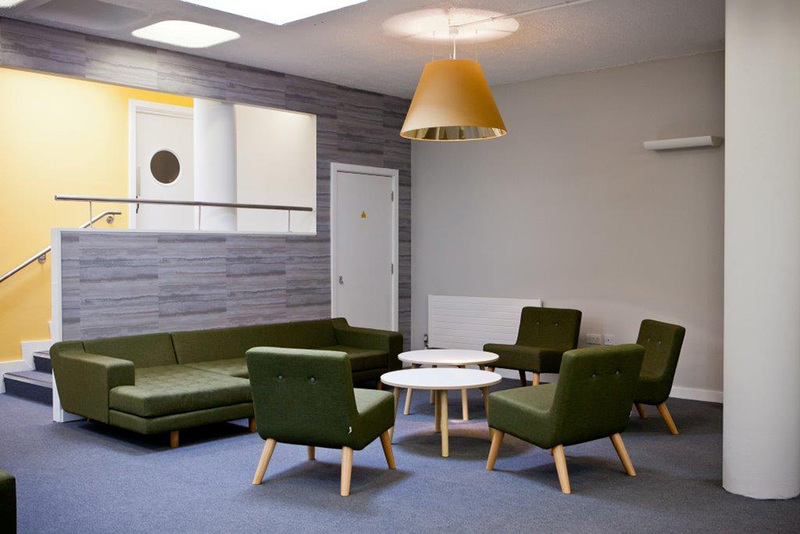 The interior colour palette is a contemporary and sophisticated blend of soft greys to ground the space. 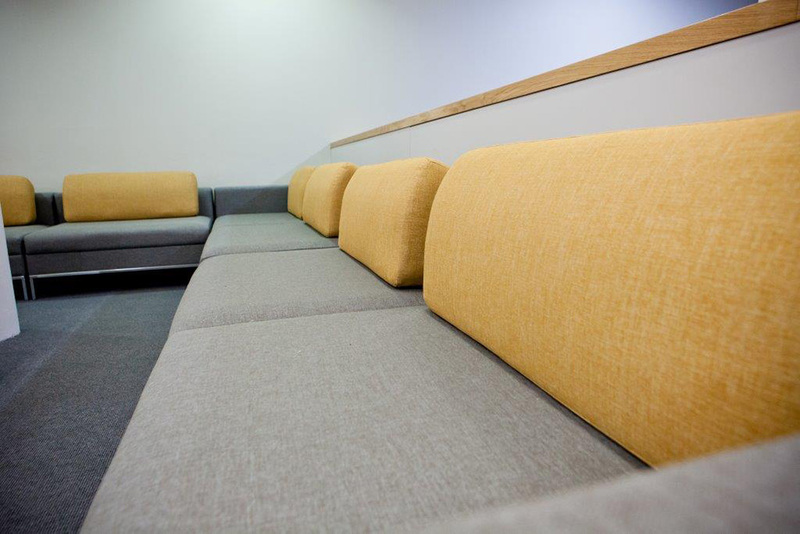 Mossy green upholstery was chosen for its calming influence and vibrant yellow accents to make the students feel refreshed. Natural materials and textured finishes can be found throughout the interior. 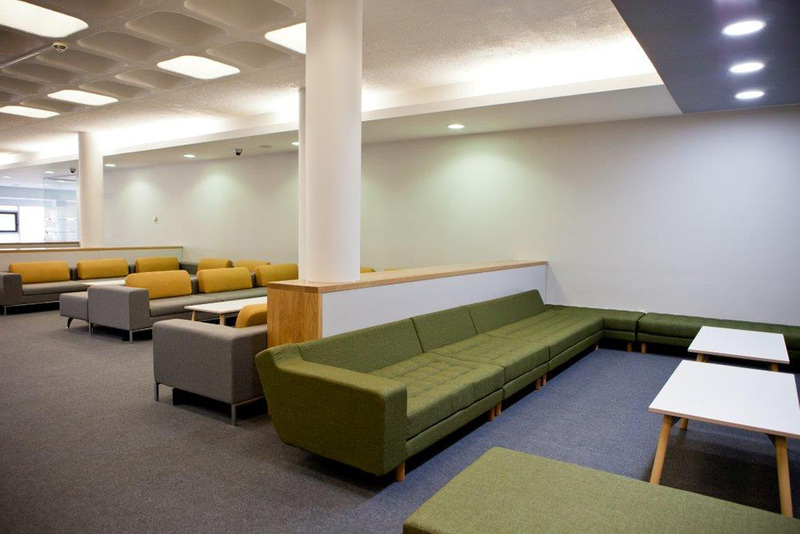 The students love their personal space, the new flexible design allows them to enjoy sharing ideas, relax, recharge, regroup and refresh. 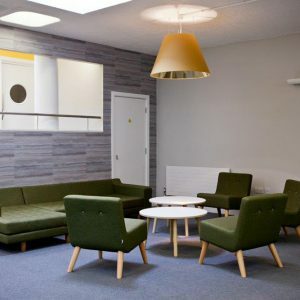 The lounge area is the central hub of the interior with comfortable lounge seating, a gorgeous textural wall treatment as a backdrop and an oversized bespoke metallic pendant creating a cosier feel not usually found in a school environment. Large canvases of student’s work is displayed on the walls in a gallery fashion personalising the space. I am hoping that over time the walls will be filled with stunning Art works giving the students a sense of pride and ownership.